Drive through any major city today and you’ll notice most pedestrians walking on the sidewalks are clutching a smart phone in their hands. They’re not reading billboards or newspapers, or listening to the radio; they’re interacting with friends on social networks. How can we impact these people? Let’s meditate on mobile marketing. By now everybody knows there’s more mobile browsers than desktop browsers surfing the web. That’s not news. Mobile use surpassed desktop in 2014. So it’s no surprise this channel has seen the greatest increase in spending for the last four years straight. And I say again that none of this should be news to any regular Surround blog readers. But what is remarkable are the number of businesses we see everyday that don’t have any mobile marketing strategy; many older businesses and b2b firms out there still don’t even have responsive websites! eMarketer reports that Ad Hoc polled marketing professionals in Canada for AdGear about their marketing allocations for 2016, and according to their most recent research done last December, Change in Digital Marketing Budget in 2016 According to Marketing Professionals in Canada, by Channel, – eMarketer Dec 2015 On average, respondents said they planned to devote 44.8% of their 2016 marketing budget to digital, up from 40.0% in 2015. Of that digital spend, which eMarketer estimates will reach C$2.31 billion in Canada this year, almost half of that or 48.1% will be on mobile. In summary, mobile will consume 17.4% of total media ad spending in Canada this year. In 2016, most of the eyeballs captured by mobile devices belonged to either Google or Facebook. There are hundreds of thousands of apps available for your smartphone whether you own an iPhone or an Android, but only a handful of apps are actually used by millions of people across the country. 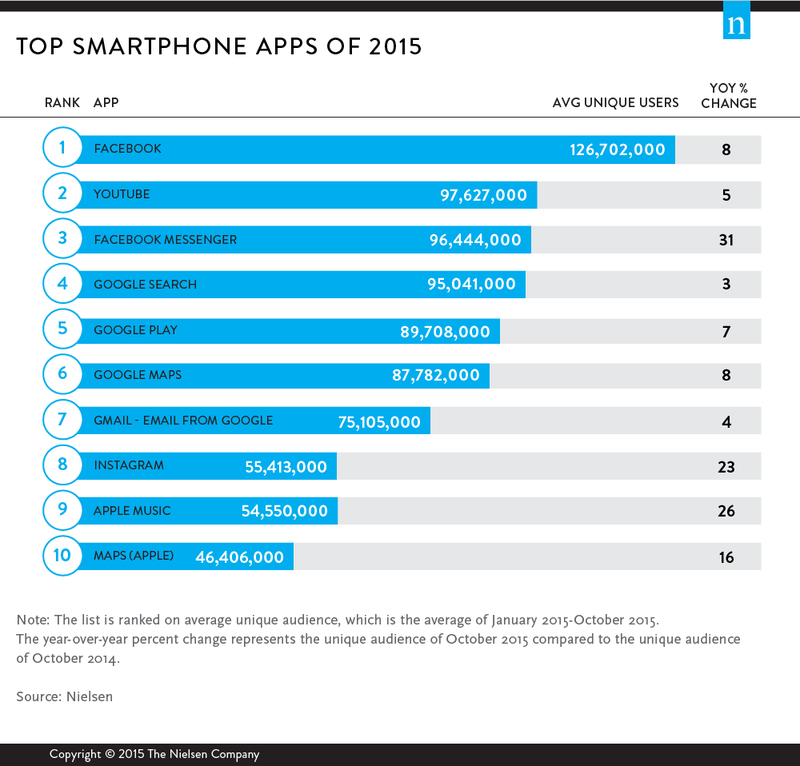 December 2015 – Nielsen research lists the most popular smartphone apps of the year. Their research clearly shows that Google and Facebook dominate the mobile app space. Facebook’s primary app proved to be the most popular mobile app of 2015 (in the United States and probably Canada too) with more than 126 million users on average. The other behemoth on your phone is Google of course, which owns and operates five out of the ten most frequently used mobile apps. YouTube is the second most popular mobile app with around 97 million unique users, and Facebook Messenger is in third place with about 96 million users in the USA. Apple has two apps on the list: Apple Music and Apple Maps. It’s another sign that It’s also a positive sign for Apple Music since the new streaming service has only been available for about six months. Mobile marketing consists of more than just ads that appear on smartphones, tablets, or other devices. Mobile marketing ad formats, customization, and styles can vary, as conveyed on different social media platforms and websites. Many mobile apps offer their own unique and tailored mobile ad options. The rise of programmatic marketing, or ads that use a kind of native artificial intelligence is just one way mobile is getting smarter. App-based marketing is mobile advertising that involves mobile apps. While 80% of an average user’s mobile time is spent engaged with apps, you don’t have to create an app yourself to advertise in this medium and catch their eyeballs. Services like Google AdMob help advertisers create mobile ads that appear within third-party mobile apps. Facebook also allows advertisers to create ads that are integrated into Facebook’s mobile app. Unlike the vast majority of independent ad-tech firms social-media networks have lots of login data, allowing them to connect user identities across devices, and Facebook’s mobile ‘Promoted Post’ ads integrate so seamlessly with the news feed that users often don’t realize they’re looking at ads. In-game mobile marketing refers to mobile ads, especially banners and pop-ups that appear within mobile games. These banners get a lot more real estate on smaller screens than they do on desktop websites. The method works best when the product or service relates to the game, and its really effective when the game can give rewards and coupons that users can spend on the business. Most common today are in-game ads that appear as banner pop-ups, and sometimes full-page image ads or even video ads appear between loading screens. 2016 will see these popups more perfectly tailored to improve user experience. QR codes are a bit of leap – to an unknown destination. They’re not as popular as everyone thought they would be, or are we still waiting for them to take off? Its true, they do appeal to advertisers who want to take users on a bit of a journey. QR codes are perfect doorways to game portals or gamified content platforms. Location-based mobile ads appear on devices in direct accordance with each user’s specific location relative to the business trying to attract their eyeballs. For example, some advertisers may only want their mobile ads to appear when users are within a few miles of their address. Google’s Enhanced Campaigns allow for advertisers to manage bids across devices, locations, and time with ease. Some advertisers may choose to bid higher for users on mobile devices who are within a certain range of their store, or may only want to bid on mobile devices during their store’s open hours, and Enhanced Campaigns make that an easy possibility for advertisers. Mobile search ads are just like regular sponsored ads (there are both text ads and image ads, for both search and display networks) except are they’re specially built for mobile and often featuring add-on extensions like click-to-call or map displays. Considering mobile search has increases over 200% every year for the last five years, its no wonder Google and other ad networks have invested time and money making their search ads shine. Creatively awesome, just look at our work. Clear and concise, mobile devices have small screens, which means words should be used economically. Simple is best. Optimized for local audiences. At Surround we know that one third of all mobile searches have local intent and Canadians very often use their mobile devices to compliment their immediate worldly interactions. They’ll ask ‘where is the nearest gas station?’ when they need fuel for their cars, or where is the biggest shopping mall when visiting a strange town, etc. So it’s important to optimize for local to make sure you are aligning with thirty percent of users’ queries. Well researched in terms of audience expectations. The type of audience we hope to reach for our clients influences the type of mobile ads and the platforms we select. Are our consumers young or old, French or English, gamers or storytellers? Are they social butterflies? photographers? travelers etc are they tech savvy? We have platforms and strategies for all types of mobile users. Tested. We don’t just play hunches – we benchmark results and measure each approach. There’s a lot of room for experimentation when it comes to mobile marketing and were not afraid to test out ad extensions using AdWords Enhanced Campaigns, Google Offers ad extension, or the click-to-call extensions. Let’s see how they work for you.